Take a pan pour 3 cup water bring to boil the water.add the maggi noodles boil the maggi noodle perfectly.after boil remove the excess water and keep it aside. Heat oil in a pan, once heat oil,add chopped onion,green chilles saute for a minute.then add chopped carrot,french beans mix well cook for 2 minutes.now add tomato,salt,turmeric powder again cook for a minute.add boil maggi noodles,maggi masala powder mix all the things.now Maggi filling is ready. 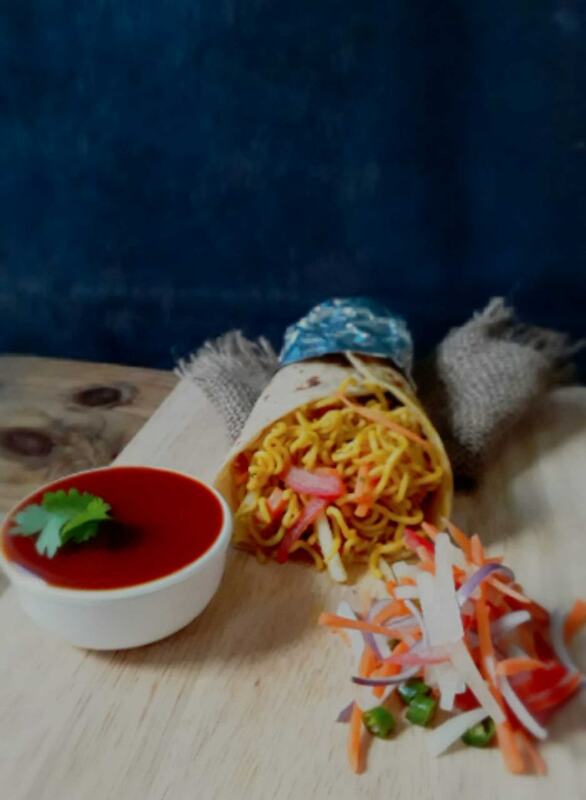 Take a chapati,spread tomato sauce and place the Maggi filling the middle of the roll.add veggies salad,sprinkle maggi masala.now roll it wrap the bottom of the roll with foil paper and seal the bottom.Now Maggi Frankie Roll is ready.